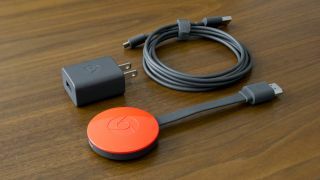 It's been a while since we saw a new Chromecast, so it's perhaps no surprise that an updated edition is rumored to be on the way: and according to a filing with the FCC (Federal Communications Commission) in the US, it should be packing improved connectivity options. Specifically, the new and improved dongle is going to rock up with support for Bluetooth and 5GHz Wi-Fi bands (a faster but shorter-range wireless standard available on most modern routers), Variety reports. A Chromecast with full Bluetooth functionality was rumored back in May. The current Google Chromecast includes a Bluetooth chip, but it's only used during the setup process – you can't use it to hook up gaming controllers or a mouse and keyboard, or to stream audio to the device. Exactly what Google plans to do with Bluetooth support on the Chromecast remains to be seen. Extra peripherals seems likely – so you could connect up a gaming pad and use the dongle as a little gaming device. Mouse and keyboard support would make navigating menus and entering text much easier too. Don't expect there to be many changes on the outside though: it sounds as though the new Chromecast is going to look exactly the same as the existing ones. Google currently sells a standard 1080p Chromecast and a 4K Chromecast Ultra. We know Google is planning a mammoth hardware event for October 4 or thereabouts, where we'll probably see new phones, new laptops, and maybe even a new Pixel-branded smartwatch too. Based on the latest FCC filings, an updated Chromecast could well be thrown into the mix as well.